Artists are the messiahs for art lovers and harbinger of good taste; they are the kings of canvas and their masterpieces fly off the shelves even before they have been barely put there. While the exclusive trade fine sketches imprints of unbelievable profits, we scratch under the surface to know which way the Indian Art Industry is heading. Is Art, only a muse of the well-heeled ? The high priced paintings sell for several lakhs or more; the kind of money, any middle class would invest for a roof over his head- here, the name admits to the blame game refuting Shakespeare’s claim, "What’s kept in a name?" The number of artists (both established and new) count to 60,000 or more, and one has to be lucky enough to be a part of the big league to rake in that kind of Moolah; only, if, your work is a mush from the whip! Another senior artist Amitava Das, gives example of Piccasso paintings that were hoarded by Cornwell way back in 1904 since he had an eye for future. Then, in later years he sold them to museums at a great profit. He adds another example of Tagore’s paintings that were recently bought in England for emotional reasons by Bengalis, Bangla Deshis and Indians. He further opines that, "Art is a passion and at times the name of the artist overshadows better work by new artists. Moreover, the Indian buyers lack the adventurous approach to buying as they think that if they spend so much on an art work, it rather have a famous signature on display. Opportunely, younger corporates still have a heart to juggle with the idea of adventurous buying". He also adds that, "three years back, the market was slow but now it has gained momentum with a definite promise of escalating further. Like share trade, the investment’s resale value depends on the name of the artist and his credibility which has more chances of increasing with time unless if there is an unavoidable calamity; whose chances are very low. These paintings also fetch a good price at auctions which is a known practice of established work. Old art like old wine gets better with age”. Galleries, that are the windows of retailing and that once specialised in traditional paintings are now putting contemporary, experimental artworks on the block while giving a chance to new art curators and exhibitors to roll their work. There is a rush of new artists every day who select galleries as per their pockets which are either profit or non profit centres as the more established galleries are reserved for the known faces. The trade gives only a handful the chance to succeed. The rest find refuge in 9 to 5 jobs. Here, quality is but a humble beginning. Other gimmicks like PR, Advertising, and Marketing etc. are needed to fuel sales. The customer’s passion equals the artist’s and as such there is little to follow the trend. And, after a few years or more, if luck has been generous, than the artist’s name starts to do the talking and his success seal is all to a committed fan force. Renu Modi, the owner of Gallery Espace which has launched many an artists successfully says that the big corporates are slowly waking up to the art call which is due to media exposure. Yet, lack of a proper consultancy and marketing body are major bottlenecks to them. So, to help them she has started a consultancy firm whose first focus will be to educate the corporate and Individuals to invest in art. And then advise those who want to venture in this trade. Help new artists establish themselves and everything concerned with the trade like making catalogues, participation in exhibitions, auctions, International represenattion etc. With the rise in trade, there is a danger of fakes doing rounds of market. Jayasri Burman, a renowned artist agrees that fakes are detrimental to the trade hence the responsibility lies with the gallery owners to inform the concerned artist immediately. She also emphasises that intellectual manipulation of her work or straight copy may hurt her a bit but she will be flabbergasted if her name is copied somewhere. One initiative to curb fake is issuance of certificate which is gaining ground. And legal recourse according to her may be on similar lines of copyright infringement act but she says it is very difficult to burst the fake racket unless the trade constituents like the buyers, gallery owners, and other artists are forthcoming with the information. According to Kishore Singh, the art columnist, "There are more rumours of fake that actually does harm more than the real fake. 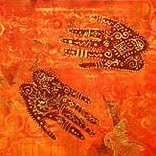 Indian art industry is moving ahead quite positively. As per an estimate by the creator of The Fine Art Fund, Phillip Hoffman, the size of the Indian market has grown from $2 million to approximately $400 million in the last seven years. Yamini Mehta, director of modern and contemporary Indian art at the London-based Christie’s agrees that, “Indian art is becoming a part of international consciousness, which is why we have seen a spectacular growth in this field”.